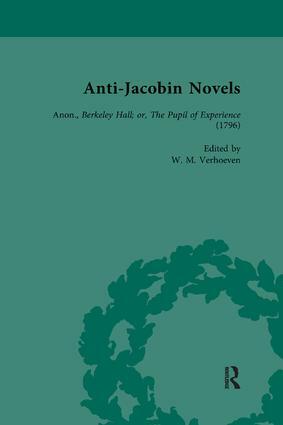 A selection of Anti-Jacobin novels reprinted in full with annotations. The set includes works by male and female writers holding a range of political positions within the Anti-Jacobin camp, and represents the French Revolution, American Revolution, Irish Rebellion and political unrest in Scotland. Berkeley Hall: or, the Pupil of Experience. The Arrival of a Stranger at Berkeley Hall. A Peep into the Parlour. Continuation of the Veteran's Story. The Conversation Continued; or the Itch of Story-Telling. Danger and Escape of the Soldier. Character of Dr. Homily and his Friends. Sketch of Matilda, the Doctor's Daughter. Pity Melts the Mind to Love. Some Account of our Young Hero. College Adventures; With the Description of a Petty Tyrant. Hostilities Commenced, and the Petty Tyrant Humbled. Treachery and Meanness Properly Rewarded. Dr. Sourby's Notion of True Courage, and a Striking Example of it. Fresh Instances of the Surprising and Marvellous. The History of Prince Pangoleen, Alias George Silverheels, Heir Apparent to the Crown of Angola. Prince Pangoleen in Fresh Difficulties. A Lesson Never to Despair. Out of Evil Often Arises Good. Description of the Bay of Monongahela. 124 . Travels of the King of the Pacific Ocean. A Learned Discussion, Ending as it Began. Excursion with the Princes Thelassin and Agapont on the Lake. Discussion on Fire and Raw Meat. Submarine Town and Temple, Sports and Festival. Narrow Escape of King Gongunza. Wonderful Voyage of his Marine Majesty to the South Pole; with a Description of the Content of Machaira. A Peck of Metaphysical Dust. Gongunza's Voyage to the Concave Sphere; and Description of the Kingdoms of Negotiana. Prince Pangoleen's Departure from Monongahela. All's Well that Ends Well; or Pangoleen's Adventure with the Princess Zalisca. Wonderful Anecdote of a Black Wig. Dr. Homily's Pleasant Sally on his Hobby. An Interesting Scene at the Tomb of Matilda. Gallant Atchievement of our Hero. Dr. Homily's Indigestion of a Mushroom. A Plenary Confession, and Absolution. Drawing Lots Sometimes not Fortuitous. A Black face and a Black Heart Contrasted. Cruelty and Cowardice, Tyranny and Meanness, Inseparable Companions. A Sudden Cleam of Sunshine Through the Clouds. A Stranger Phenomenon Than that of the Black Wig Turned White. A Sea Mess of Chowder; Composed of Vegetables, Fish, Flesh, and Fowl. The Sly-Boots 315 Caught Tripping. Tim's Departure from Berkeley Hall, and Dr. Homily's Farewell Discourse. Dr. Sourby and Our Hero's First Taste of Unceremonious Freedom and Simple Life. Strange Alarm, Flight, and Misadventure. Different Species of Oratory Suited to Different Men. Some Pleasure Derived from Adversity. Various Opinions on the Extension of Freedom: and a Quaker's Conversation and Hospitality. Strange Rupture at Cranberry Hall. All in the Wrong: or Sancho in the Suds. Aaron's Malicious Triumph and Unexpected Defeat; or the Story of the Gentle Jessica. Fantastical Projects, and Desperate Resolutions. Great Triumph of Dr. Sourby, and his Notion of Marriage. Sancho's Description of the Blessings of Natural Society and Uncivilized Life. Private Sorrows Lost in Public Cares. New Arrangements of Domestic and Private Concerns. Fortunate Interview with a Stranger. Visit to the Cave of a Recluse. History of the Misanthrope, or Recluse of the Forest. New Scenes of Danger and Difficulty; or, Man in a State of Nature. A Talk from the Raven Chief. Generosity and Flight of the Lovely Ancuna. Indian Eulogiums and Ceremonies of Commemoration. Apprehension and Imminent Danger of the Fugitives. Original Letters from Dr. Homily and Barbara Forester. Flux and Reflux of the Tide at Cranberry Hall. Calm and Commotions at Berkeley Hall. Ceremony of the Consideration of the Busts. A View of Dr. Homily on his Hobby-Horse. The Arrival of the Long-Lost Travellers. Entertainment of the Indian Warriors at Berkeley Hall. Tonondoric's Observations at Berkeley Hall. Dialogue Between Miss Moody, Her Brother, and Dr. Homily. Dr. Sourby's Adventure in the Recluse's Cave, and Observations on His Return Home. Wonderful Revolutions at Cranberry Hall. Interview of Letitia with our Hero and the Indian Princess. Squire Forester's Declaration of Love to Miss Moody. Squire Aaron's Triumph and Treachery Successful. The Mask Dropped, and Open Hostilities Commenced. A Gothic Appeal to Cold Iron. Danger of our Hero, and Intrepid Conduct of Letitia. Sequel of the Route, and Diligent Pursuit of Tickle. Arrival of Two Uncommon Travellers. Appearance of Two Different Characters, or the Usual Mode of Consolation. Our Heroine's Interview with Dr. Homily. An Event which the Sagacious Reader has Probably Anticipated. Letitia's Letter to Miss Lumeire, and Dr. Homily's Disaster. Peregrination and Disasters of Tickle. Discovery of the Hermit's Retreat. Sink Under Misfortunes, But Overcome them by Fortitude. Final Visit to Berkeley Hall.